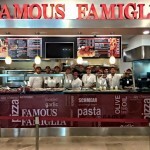 Famous Famiglia is excited to announce its latest new opening at Cancun International Airport – Terminal 3 in Cancun, Mexico. This opening marks the third opening in Mexico. Terminal 3 welcomes many international travelers into Mexico. 10.2014 – Famous Famiglia announces that it was awarded a location at Puerto Vallarta International Airport, in Puerto Vallarta, Mexico. The new location is set to open in December of this year, welcoming the many tourists and travelers. This airport is a major transportation hub to North American air travelers.